Donald Trump went to church last Sunday. Lots of people did. My guess is he doesn’t do that on the regular. Nor do most people who at one time or another have been religiously observant but for some some reason have been on a kind of hiatus. But you run for president and go back to church and people take notice. I suppose it’s the job of the press to take note of such things. I don’t begrudge them. There is a curious bi-product of this kind of reporting though. It poses a kind of religiously voyeuristic Twilight Zone question: what would one say if presented with the opportunity to preach to the Donald? 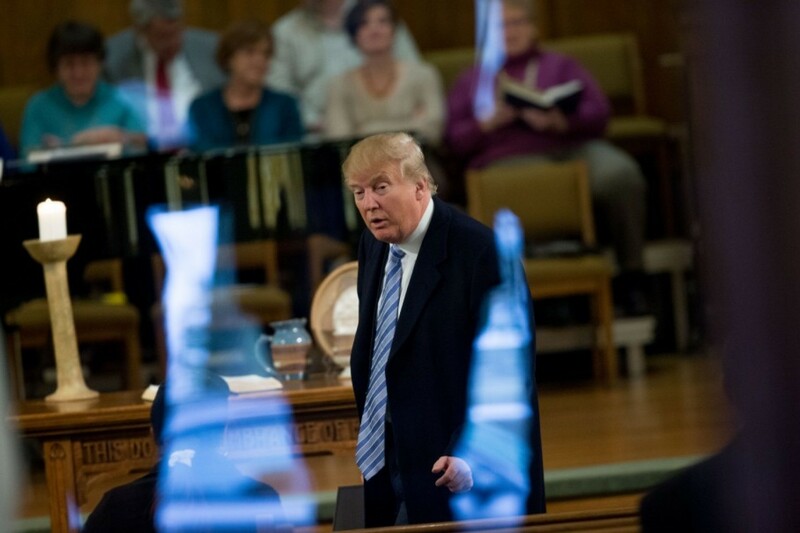 Trump went to a small Presbyterian church in Iowa…but I repeat myself. By most accounts it seems like he nodded affirmatively during the scripture readings and sang all the hymns. But the media was most interested in the sermon. Wherever you find yourself on the political spectrum the press’s account provides the raw material to provoke some combination of discord, discomfort and aggravation. But there’s also room for delight. The preacher, The Rev. Dr. Pamela Saturnia, went with the lectionary texts. She didn’t cherry pick readings when she knew Trump would be there (she didn’t have much of a heads up, as it was a surprise visit. But still, to her credit, she didn’t call an audible.) Remarkably, she didn’t mention Trump by name or grandstand in anyway. The sermon focused on the fourth chapter of Luke where Jesus finds himself back in his hometown reading the prescribed passage from the Torah after which he proffers his own interpretation (verses 14-21). He is then promptly run out of town. But I’m most interested in the quote Dr. Saturnia used (attributed to a friend and colleague) on the task of preaching. I’m sure you’ve heard it before. It’s a quote I’ve heard attributed to so many different people so many different times that it seems like its origin is in Plato’s realm of the eternal forms, outside of space and time. It’s one of those sayings that’s so ubiquitous it’s impossible to plagiarize. “Comfort the afflicted and afflict the comfortable” v. phr. A Christian expression that describes the work of Jesus, the Holy Spirit, the Bible, Biblical preaching, and Christian ministry. Basically the expression affirms that God demonstrates mercy and grace as well as judgment in his dealings with people. The expression was coined by Finley Peter Dunne (1867–1936), an American journalist, to describe the crucial role that newspapers play in society: “Th’ newspaper does ivrything f’r us. It runs th’ polis foorce an’ th’ banks, commands th’ milishy, conthrols th’ ligislachure, baptizes th’ young, marries th’ foolish, comforts th’ afflicted, afflicts th’ comfortable, buries th’ dead an’ roasts thim aftherward” (Observations by Mr. Dooley (1902) 240). (Note: Several authors have erroneously credited the origin of the expression to E.W. Scripps, H.L. Mencken, or Joseph Pulitzer.) For most of the 20th century, the expression was used only in the context of newspapers, journalists, and the mass media. Martin Marty seems to be the first person to apply this expression to religion (see 1987 citation). The expression continues to be used by journalists to describe their profession, but the expression now has a distinct and separate meaning in the Christian community. 1987 Marty Religion and Republic: The American Circumstance 82 : Let us speak of these [roles of the church] as “priestly” and “prophetic.” The priestly will normally be celebrative, affirmative, culture-building. The prophetic will tend to be dialectical about civil religion, but with a predisposition toward the judgmental. The two are translations of Joseph Pulitzer’s definition of the compleat journalist or, in my application, of the fulfilled religionist: one comforts the afflicted; the other afflicts the comfortable. 1988 Hewett, ed. Illustrations Unlimited 352 : The pastor … seeks the lost, visits the sick, counsels the troubled. He comforts the afflicted and afflicts the comfortable. 1994 McIlhon A Little Out of the Ordinary: Daily Reflections for Ordinary Time 87 : Quite prophetically someone comments that Christianity comforts the afflicted and afflicts the comfortable. 1995 Eckardt How to Tell God from the Devil: On the Way to Comedy 48 : One familiar and viable way of living with the spiritual finding that God is at once judge and font of mercy is through the assurance that God afflicts the comfortable and comforts the afflicted. 1999 Morris A Lifestyle of Worship: Making Your Life a Daily Offering 122 : When the Spirit of God is present in a gathering, He “comforts the afflicted and afflicts the comfortable.” That about sums up the work of the Holy Spirit. 2004 Dobbins Take My Hand 206 : They say that the Bible comforts the afflicted and afflicts the comfortable and this week it is painfully true for me. 2005 Alling, Schlafer Preaching as Pastoral Caring ix : “Pastoral” and “prophetic” are routinely contrasted, even by those who affirm the values of both. “Good preaching comforts the afflicted and afflicts the comfortable,” says the old homiletical cliché. 2007 Van Pelt, Hancock A Parent’s Guide to Helping Teenagers in Crisis 24 : There is a biblical tradition that God comforts the afflicted (and occasionally afflicts the comfortable). 2007 Kearns, Keller Ecospirit: Religions and Philosophies for the Earth 33 : Recently she has been lobbying city officials to offer more support for a local community center that provides opportunities for teenagers to be tutored after school. People find her good-humored, but also at times irritating. Like Jesus, she comforts the afflicted but also afflicts the comfortable. 2012 Belle Words of a Good Shepherd 175 : Preach the Word with courage and conviction; that Word which is the gospel of grace but also the gospel of judgment; that Word which comforts the afflicted and also afflicts the comfortable. It’s interesting to note that this famous preaching dictum comes from the secular press. I don’t know that I’ve ever met someone that I’ve gotten to know in any deep or significant way that was at the end of the day comfortable, at least in their own skin. The proclamation of the Gospel, which is simply the preaching of Jesus, is always comforting. It never afflicts. Not so with the Law. The Law can only afflict. The Law afflicts in one of two ways: it afflicts in a way that serves the Gospel or in a way that mutes it. There is a kind of affliction that virally begets more affliction. It says “you may feel bad but the source of that feeling is your failure, but you didn’t really fail…you can edit that post or tweet or that mistake at that point in your life where you feel like you’re in the worst ditch anyone could imagine.” But it’s still in your hands, even if it feels slippery. This is affliction that can disguise itself in countless ways as false comfort. The problem with the “comfort the afflicted, afflict the comfortable” preaching motto is that it starts with a false disjuncture as its premise. No one is really comfortable much or even most of the time, and everyone is afflicted in some fashion all the time. The preacher’s task is not to afflict the comfortable. It’s to listen, intuit and interpret where the people who walked on broken glass to get to church are already feeling afflicted by the Law so that the Gospel can be spoken to them in ways that offer real comfort. It seems to me that part of the preacher’s goal was to afflict Donald Trump, whom she sees as the quintessential example of the comfortable. All his means and wealth aside, Trump’s authenticity and refusal to play by the politically correct rules of the ever increasingly sanitized public square is rooted, I suspect, not in an abundance of comfort but a lack of it. It strikes me as at least partially a kind of “fake it ’til you make it” kind of authenticity. That’s far from comfort. It’s only grace that can turn the Donald, or any of us, from a slave to a child and bestow the faith filled freedom that makes duty into choice. Nevertheless there seems to me to be a blind spot in the perspective offered here. Is it really the case that the preacher’s task is NEVER to afflict the comfortable? Never preach a word of Law but to presume that the law is already significantly afflicting the hearers in precisely the way they need to hear it? I can attest, both through my own experience and through my observations of others, that many times we are oblivious of or in denial of our own sin. We often do not recognize the depths of our depravity, or the harmful effects our actions have had on others, even the ones we profess to love. Why would this be, if the Law is already sufficiently at work within us? The only consistent answer I can come up with is pride- C.S. Lewis’ “great sin,” the one from which all others are derived. Pride can blind us, harden our hearts, shut down our listening ear of empathy. Pride is what makes us sometimes say “no thanks” to the gospel of Jesus. When we are puffed up, even if it is masking a deeper sense of insecurity, it can make us all but impervious to the sweet gospel word of God’s love for sinners. So I can’t escape the conclusion that, in some sense, a part of the preacher’s task is, when the situation requires it, to preach the “bad news” in order that the good news might be heard afresh. If you look at the examples of biblical preaching, this is often borne out. Surely many times, such as with the jailer in Acts 16, our sin is self-evident that only God’s gracious word of mercy is necessary. But on many other occasions, prophets, apostles, and Jesus himself, when confronted with hearers whose hearts are hard, are compelled to warn of God’s judgment. The prophets of Israel didn’t just preach mercy (gospel), they substantially preached God’s judgment (Law)on the people for abandoning the covenant. Much of the public preaching of Peter and Paul in Acts follows this pattern as well. And Jesus (who is Gospel in human flesh!) himself often does not simply assume the law is working its needed effect on his hearers, but calls them out for their pride, injustice, and exploitation of others (cf. Matt 23). Indeed, the need for repentance was a key facet of his preaching of the kingdom of God from the very get-go. From the moment he arrived on the scene, in Mark 1:15 to the moment of his ascension on Luke 24:47, repentance is a key part of Christ’s teaching and preaching, because without it, the good news is no good. It’s a word we all need to hear in order to hear the gospel aright. And if the example of the prophets, apostles, and Christ himself is any indication, there are times when law must be preached in order that the gospel’s power to shatter our pride might be heard rightly. Regarding the previous comments, the OT prophets and preachers were under the law— and It wasn’t until after the crucifixion/resurrection that the new era was ushered in. The job of The Holy Spirit is not to “convict” us of our sin— it is to “convict” us (“convince” us) of our righteousness in Christ.